On to my question. Cake or frosting? Yes, some people are both but in my experience, people identify with being one or the other. I am cake all the way. I remember being at birthday parties as a child and asking for a piece of the store-bought cake with the rose on it because that is what all the other kids did, tasting the rose, and then scraping all the frosting off so I could get to the (hopefully) chocolate cake underneath. Cake girl, right here. Frosting is too sweet, too buttery, just too much for me. There are two exceptions. One is this cake where the frosting is so delicious, so ridiculously decadent, that I love it even more than the cake. (And I really love that moist chocolatey cake.) The other exception is carrot cake. I am, um, not a fan of carrot cake. Just not for me. I do like cream cheese frosting and so, in the case of carrot cake, I would scrape off the frosting and leave the cake. Randy and I are different in many ways. I do believe it’s one of the reasons our marriage works. We have different strengths and weaknesses and we balance each other. One of his weaknesses is that his favorite cake is, you guessed it, carrot cake. (Kidding. Of course. Kind of.) I’ve made him carrot cupcakes and inside out carrot cake cookies, but never in all the years we have been together have I made him carrot cake. His birthday was on January 2nd and his parents, who gave me a cookbook with a lovely sounding carrot cake were in town, so it was time. Most people who don’t like carrot cake don’t like the idea of a vegetable in a cake. I don’t like it because, while I like nuts, raisins, pineapple, and coconut – I don’t like them in cake and I certainly don’t like them all together in one cake as some recipes would have you make. The carrots are the least of my problems. So when I found a cake that featured none of those extras, just a lot of spices and even a bit of whole wheat flour along with the carrots, I knew I had my recipe. Of course, the frosting is great too. I’m sorry I don’t have a photo of a slice of cake. I was serving this to a large group and had to cut very thin slices and I happen to think a thin slice of cake, while delicious, is a little sad looking. One more note, the children in the group were all clamoring for a second piece before they were half way done with their first – until they learned that it was, in fact, carrot cake – and then the table got very quiet. My one quibble with this cake is that the actual cakes were on the flat side. I might one and a half the recipe for the batter next time so the cake it a little taller. Preheat the oven to 350ºF. Spray the bottom and sides of 3 9-inch round cake pans with cooking spray. Place the pans on a sheet of parchment paper and trace three circles the same size as the bottoms of the pans. Cut out the circles and place in the bottom of the greased pans. Cream the butter, sugar, and molasses together in the bowl of a stand mixer fitted with the paddle attachment until light and fluffy. While beating the mixture on low speed, add the eggs, one at a time, beating after each addition. Using a rubber spatula, scrape down the bottom and sides of the bowl, and beat again until the mixture is smooth, light and creamy. Stir the flours, baking soda, salt, baking powder, and spices together into a separate bowl. With the mixer on low speed, alternately add the dry ingredients to the creamed mixture with the buttermilk, beginning and ending with the dry ingredients. Scrape down the bottom and sides of the bowl sveral times. Mix lightly but thoroughly between each addition, until ingredients are just combined. Add the carrots and lemon zest, and stir by hand until combined. Gently scrape the batter into the pans, dividing the batter evenly between the three pans. Place in the preheated oven, and bake for 30 to 35 minutes, or until a knife inserted into the center of the cake comes out clean and the sides of the cake have pulled away from the sides of the pan. Allow the cakes to cool for 20 minutes, then run a thin knife around the edges of the cakes (a palette knife works best) to make sure they are not stuck to the pans. Carefully remove the layers from the pans and settle on a wire rack to finish cooling. Cream the cream cheese and butter together in the bowl of a stand mixer on low speed. Beat until the mixture is smooth and creamy and no lumps of butter remain. Add and combine the vanilla. Add the powdered sugar 1 cup at a time, blending on low speed until fully incorporated. Using the rubber spatula, scrape down the paddle, sides , and bottom of the bowl. Beat the mixture on medium speed until light and fluffy. When the layers are completely cool, invert the first layer onto a cake plate so that the parchment side is up. Carefully peel off the parchment and throw it away. Spread about 1 cup of the cream cheese icing on the top surface of the cake with an offset spatula, pushing the icing all the way to the edges. Place the second layer on top of the first and repeat the process – removing the parchment paper and spreadting the icing. 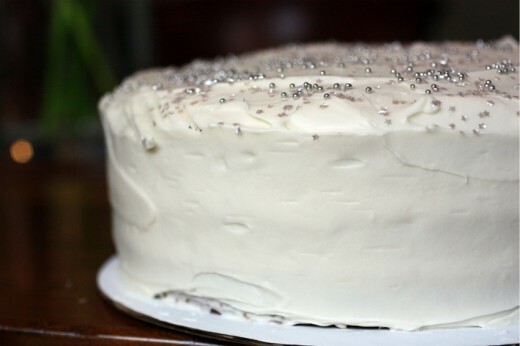 Top with the third layer and apply a very thin coating of icing (a crumb coat) all over the cake. Refrigerate for 1 hour. Remove and finishing covering the cake with the icing. Carrot Cake can be kept covered at room temperature for up to three days and can be refrigerated for up to one week. but for the love, where is the photo of the inside of the cake? Beautiful! Carrot cake is one of my favorite all time desserts! I love carrot cake, but I too hate when it’s loaded with nuts, coconut, or any other add in. The last few times I’ve made it though, I’ve actually ground the nuts and folded them into the batter. I think it imparts a really nice flavor on the cake but keeps it from feeling like the dessert is overwhelmed with different textures. I’ll have to try this one, recipe looks spot on! I’ve never in my life eaten carrotte cake with anything in it like you described, yuck. But my mom was a boxed cakemix gal, so I’ve had plenty of plain carrotte cake. I have a from-scratch recipe that I’ve been using for years that did call for coconut in the frosting, but I just leave it out. That is, if I use frosting at all — I like cake enough to eat it alone, or with a sprinkling of cinnamon-sugar on the top [if added before going into the oven the sugar makes a slightly crunchy top, added after coming out of the oven the sugar can melt into the warm cake]. I really love both cake AND frosting. LOVE. Serious love. Probably I veer maybe a bit more toward frosting. But my love for each is so great that it’s not really enough more to speak of it. That makes no sense. Ignore me. I’ll be making this. I love carrot cake, as I think I’ve told you. I always leave the nuts and pineapple and raisins out though. So it’s basically just a carrot spice cake with the best frosting ever on it. Okay by me! Carrot cake slices are so hard to get a good picture of. I think the trick might be to freeze the cake. But uggg, that would be a PIA! I love carrot cake mostly because I love cream cheese frosting, but also the lovely spices in the cake. The only thing I add is maybe walnuts, but none of those other additions. This one looks beautiful. I am not a frosting gal…not much of a cake gal either, it is all about the cookies for me. I do like some cakes and this one looks like a winner! That’s a lovely cake. I love the cream cheese frosting. I’m with you on carrot cake, although last year I made one for my sister-in-law’s birthday – full of ginger as well, and I made it in a bundt pan just to be different and it was divine. 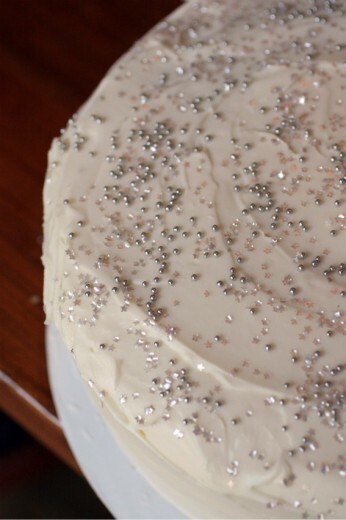 I love the stars on this and the frosting looks so pretty. King Arthur Flour… my grandmother taught me how to bake bread from a small King Arthur Flour cookbook. She insisted on ordering King Arthur Flour. Always. Great memories today, just from reading your post. Thanks! but your icing with the decorations are awesome, very classy, perfect for a celebration! I’m definitely a cake girl, too (with maybe the exception of chocolate cream cheese frosting)! What I really like about this recipe for carrot cake is that it uses butter instead of oil! I am not a fan of baked goods made with oil — to me, it makes for an unpleasant texture… Your cake is lovely! I will make a note to get some of those KA stars next holiday season! Happy birthday to Randy, belatedly! 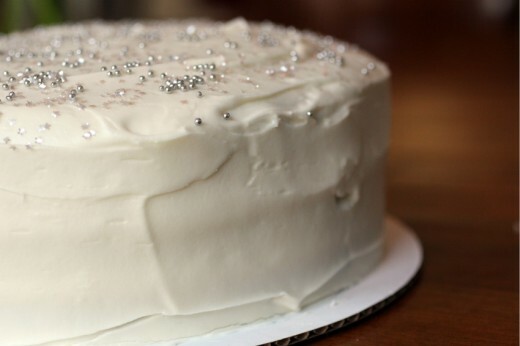 I LOVE cake, and I can do without frosting…it’s usually too sweet for me. I do like a mild cream cheese frosting though. I just bought a slice of carrot cake today from Whole Foods, perfect timing! Thanks so much for sharing this cake. I love cake and can’t wait to try it. I would love to see a slice piece of cake. Happy belated birthday to Randy! And a Happy Happy New Year to all of you. I am behind, or catching up on December, with all my reading and just had a moment to visit you over a cup of tea. I have to say I am more of a cake girl but when it is a good frosting, I can eat the whole bowl. It cannot be too sweet, needs to be really creamy! Lenny loves carrot cake as well, and I never got a chance to make one last year, will have to try your new recipe in July. I’m with you on the cake and with you on the cream cheese frosting/carrot cake. I made carrot cake twice in December – once for my husband’s birthday and once for my friend’s. Turns out it’s one of the easiest and best cakes to make gluten-free, hence making it the second time. I’ll have to try it without the raisins and nuts on the next atttempt. I think I’ve had enough of it for awhile though! i LOVE carrot cake, it’s certainly a favorite. However, just like you, I don’t like all the junk inside. I am a just carrots and maybe a bit of coconut girl. No nuts, raisins or pinneapple, blech. I’m sure Randy appreciated it, what a beauty. Hi I often came here in your blog but I think I had never commented yet! I love carrot cakes and this one is really beautiful! Would you like to partecipate to my Blog contest about eggs free dessert?! I hope you will do!